We’ve planned the perfect start to your week! 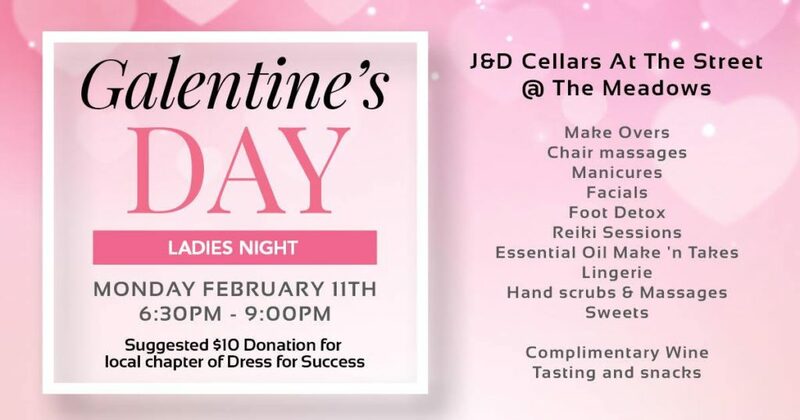 Get a sitter, gather up your girlfriends, and head over to J&D for a relaxing evening of pampering, delicious wine & tasty treats! We’ll have a special Galentine’s Day Cocktail for the evening! And of course all of your fave J&D wines, sangria, and spiked mulled wine! • The $10 admission is a suggested donation so we can only accept cash at the door for that. • There not advanced ticket sales. First come, first served. • it’s up to each individual vendor if they charge and how much.